This past week has been sooooo cold here in New England and it’s not even officially winter yet. Yesterday morning brought single digits temps to our area. Brrr… 10 more days til Winter Solstice and the longest night of the year. I’ve often thought about how our early ancestors must have felt, experiencing the growing darkness and not knowing that it would eventually recede and the lighter days would come back again. No wonder there was much celebration at this time of year, honoring the Return of the Sun. Ok, on to tea. My morning tea is an Oolong from China, appropriately called Eastern Beauty with its gorgeous full leaf and amazing honeyed aroma. 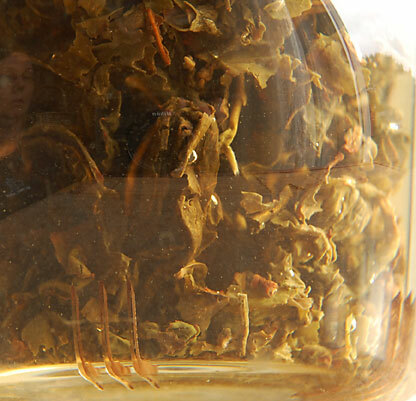 Back in August, I dedicated the whole month to Oolong, or Wulong, teas. 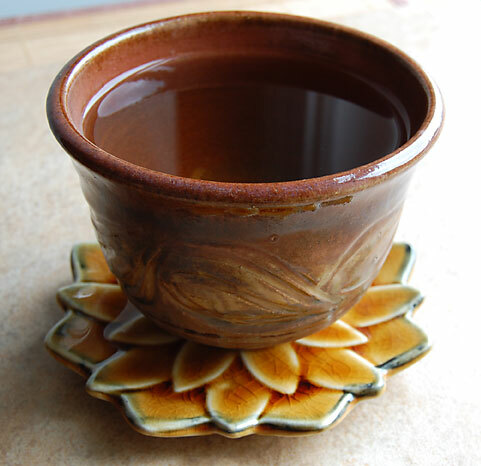 You can start reading about this wonderful type of tea here. 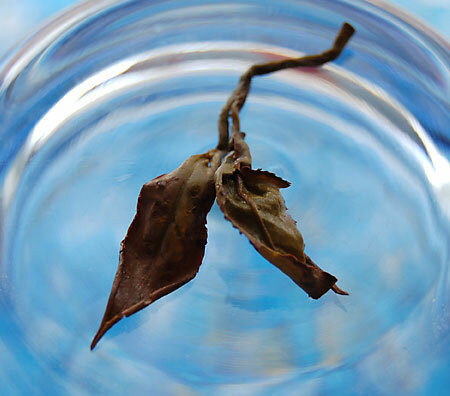 I steeped the tea leaves for 4 minutes in 180 degree F water. The intense honey aroma greeted me as I poured my first cup. Mmmm…. I love how the color of the liquor reflects the distinct aroma of this tea. The flavor is silky smooth with notes of honey and flowers and a hint of chestnut in the finish. 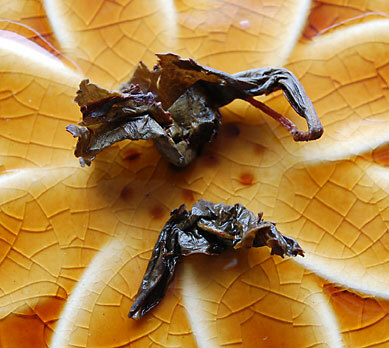 At this gift buying time of year, a sample of this tea would make an exquisite gift for the Oolong lover on your list. I know that it’s going in a few of my stockings. You’ve probably noticed the amazing art paper I’ve used as a background today. My dear friend, Amy, found it during her recent trip to Italy. Over dinner the other night, she told us how when they discovered the shop that her husband knew she would be in there for awhile. I’m honored with her beautiful gift. Thanks Amy! I know that I’ve been sorely neglecting the “art” part of my blog these past months. During this busy time of year, it’s been so challenging to get any kind of time in my studio. What I have been up to though is gift making with my pointy sticks to bring warmth to heads, necks and hearts. My goal in the new year is to get back to my art and sharing it with all of you. Yesterday was a very special day for me. My parents arrived from Michigan for a visit and to see my new place. They were due to get here sometime in the afternoon but arrived in the morning just as I was sitting down to do my tea post! As we are having so much fun chatting and visiting, I will quickly leave you with my photos from yesterday’s cuppa, a Chinese Oolong called Tie-Guan-Yin Second Grade. 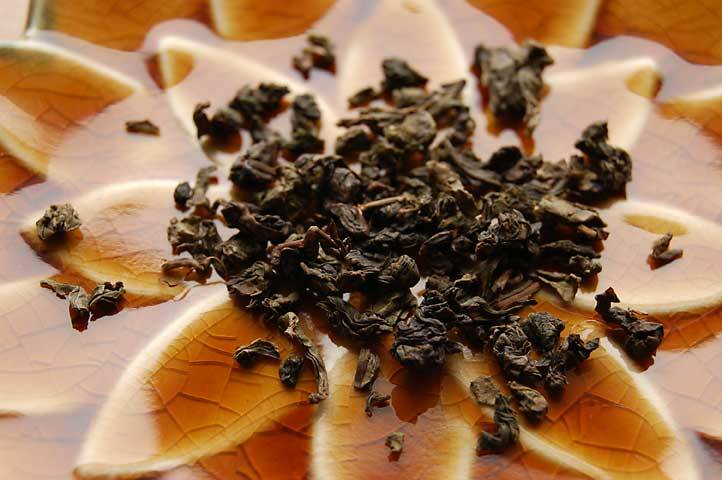 With its woodsy, nutty flavor and notes of honey, it’s the perfect tea if you’re looking for a “Chinese restaurant” type of tea. Enjoy! A thin light threads through the clouds this morning, illuminating the light frosting of snow covering the ground and the trees. We’ve had snow showers on and off for the past week that will continue through this weekend. I love this kind of snow because it doesn’t muck up the driving and constantly gives everything a fresh coating, covering over the dinginess on the side of the road. 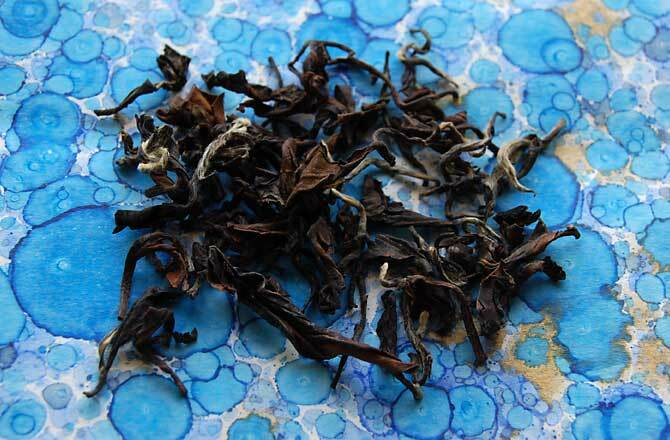 This morning I have brewed up a cup of a Chinese Oolong called Da Hong Pao. 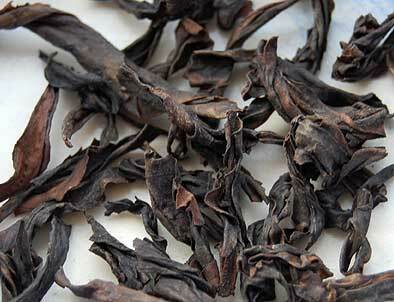 It is grown in the gorgeous Wu Yi mountain region, located in the Fujian province of China. 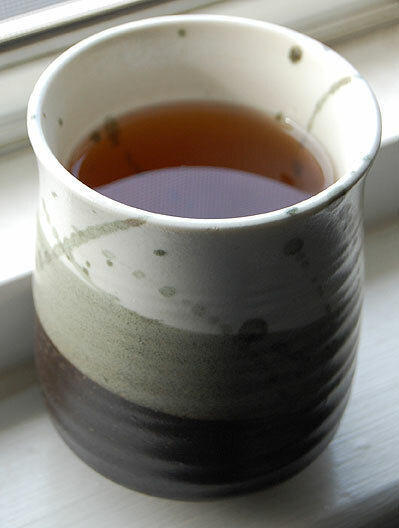 Traditionally, it is an old and venerable high quality tea reserved especially for honored guests. 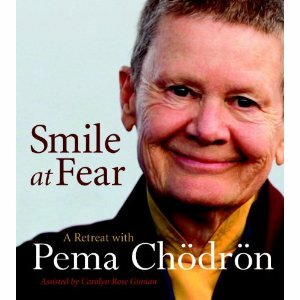 So, this morning, I honor and raise my tea cup to you, dear tea readers. 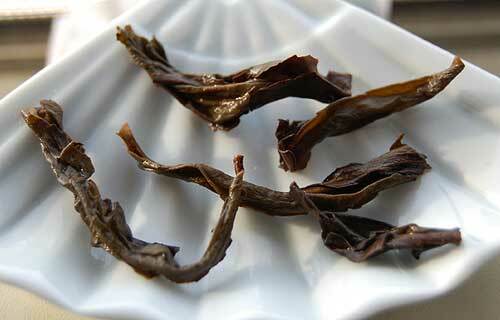 The leaf is huge and very dark, even after steeping. 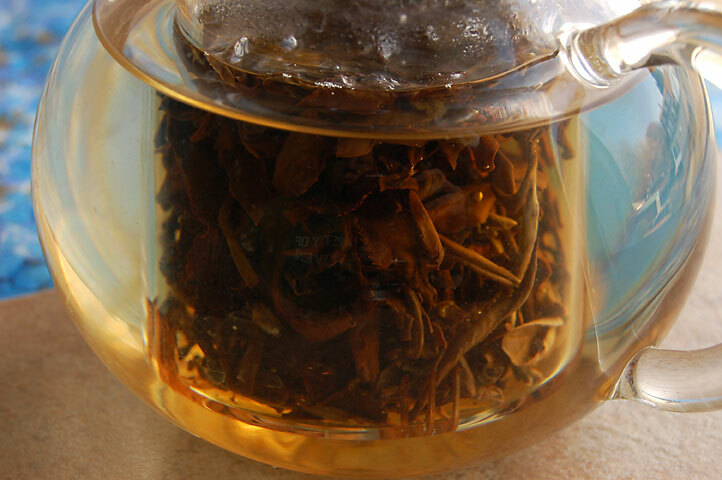 I steeped for 4 minutes with 190 degree F water, revealing a dark amber liquor with a sweet chestnut aroma. 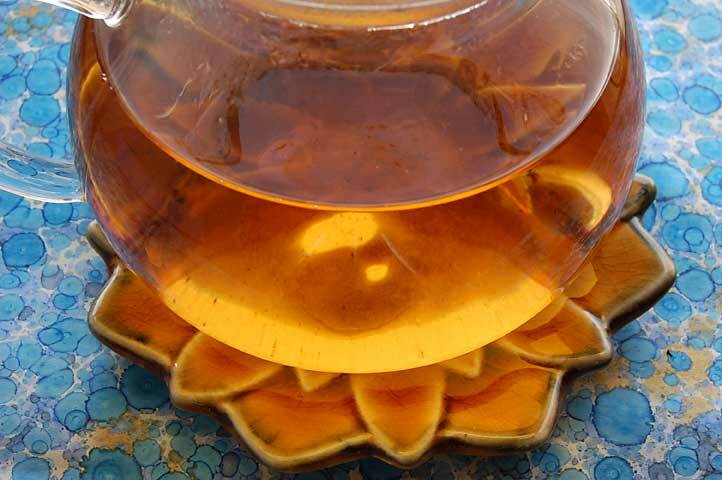 The taste fills my mouth with buttery smooth honey and nutty notes. 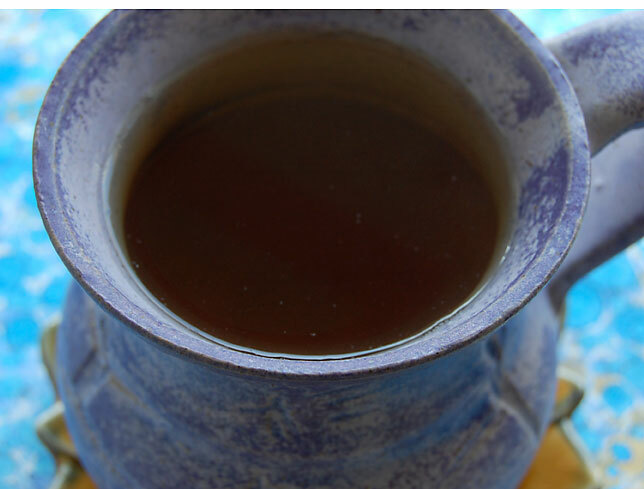 This tea was reputed by some to help with weight loss. I’m not sure what was so different in the components of this particular kind of tea that it would act in this way. 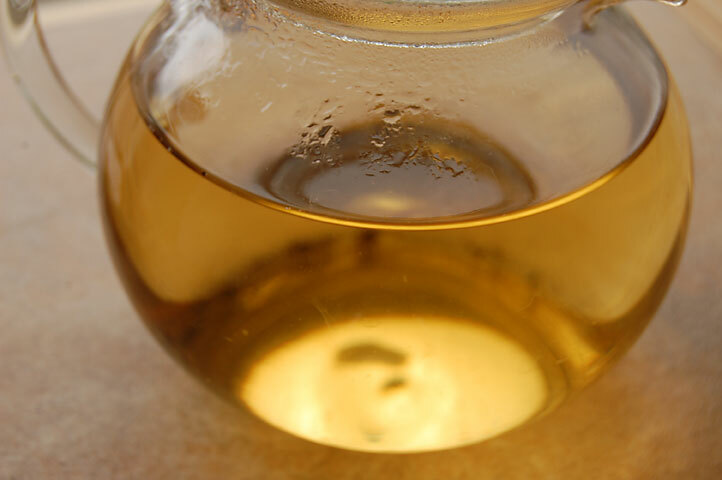 You can read extensively on the internet about the “miracles” of this tea, including a lot of articles explaining its weight loss secrets. If you’d like to read about debunking this myth, go here.